UMSC recognizes and values our referees! Without our amazing referees there would be no games and rely heavily on them in our outdoor and indoor seasons. Click here to register for more information and to register for the entry level and small sided referee courses. Are you looking to move from a Grade 4 to a Grade 5 Referee? 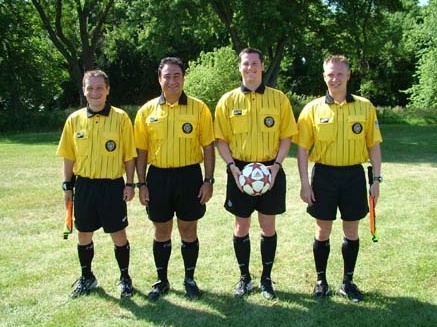 Are you looking to move from a Grade 5 to a Grade 6 Referee? Many game officials have questions on how long a game should be and what rules apply. We encourage you to review the following Matrix's provided by the Ontario Soccer Association. UMSC uses the Retreat Line for all 5v5, 7v7, 9v9 small sided games. • 5v5 - Half way line. It is recommended the goalkeeper does not drop kick the ball. • 7v7 – 1/3rds line. • 9v9 - 1/3rds line.